By the end of July 2011, around 1.54 crore mobile subscribers had submitted requests to switch their service provider while retaining their phone numbers. As many as 25.6 lakh people opted for mobile number portability (MNP) in the month of July itself, according to telecom regulatory authority of India (TRAI). The most number of MNP requests came from the state of Gujarat state (for the third successive month) followed by Maharasthra (for the second successive month). Tata suffered heavily (most probably due to MNP) with more than 26 lakh Tata subscribers opting out of their connections. Videocon also saw a decline of close to a lakh subscribers in the month of July 2011. The number of telephone subscribers in India grew at a rate of 1.29 per cent and increased to 892.55 million at the end of July 2011 from 885.99 million at the end of June 2011. The share of urban subscriber saw a decline while the share of rural subscribers increased. 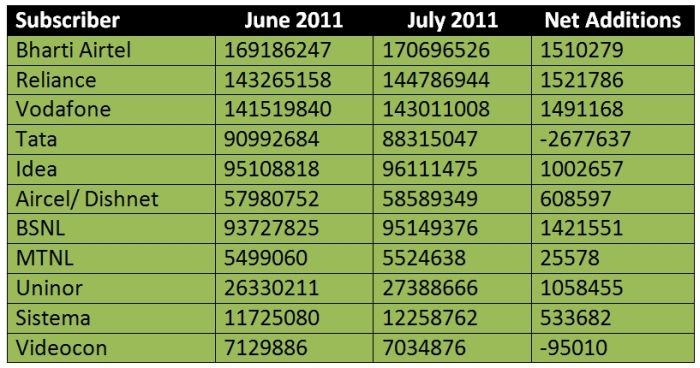 Here is a table showing the wireless subscriber base (and net additions) of the top providers in July, 2011. An interesting fact was that out of the total 858.37 million subscribers, only 601.73 million subscribers were active subscribers on the date of peak visitor location register (VLR) for the month of July 2011 (although the data excludes the CDMA VLR figure of BSNL). The proportion of VLR subscribers was approximately 70.65 per cent of the total wireless subscriber base reported by the service providers (an increase from 69.83 per cent recorded in June 2011). Telecom operator Idea lead the tally with 93.31 per cent of VLR subscribers as opposed to total number of subscribers, followed by Bharti Airtel with 89.86 per cent; Videocon was at the bottom (replacing Etisalat) with just 33.84 per cent which means just around one in three subscribers to Videocon are active. The wireless segment's (GSM, CDMA, FWP) total subscriber base increased to 858.37 million at the end of July 2011 from 851.70 million in June 2011, registering a growth of 0.78 per cent. Wireless subscription in rural areas grew 1.05 per cent while the urban subscription grew 0.64 per cent. Private operators dominated the wireless market with 88.27 per cent market share. Bharti Airtel continued as the top player during the month of July 2011 with more than 17 crore subscribers (19.89 per cent of the total wireless market share); Reliance came second (16.87 per cent) followed closely by Vodafone (16.66 per cent). Idea, Tata, Aircel and state owned firm BSNL were the other big players. Unlike the wireless segment, the wire-line segment's subscriber base saw a decline from 34.29 million in June 2011 to 34.18 million at the end of July 2011, showing a shift from wire-line to the wireless. The share of urban subscribers increased while the share of rural subscribers declined. The wire-line segment was completely dominated by PSU operators in the month of July, 2011 with 82 per cent market share. BSNL dominated the market with more than 2.45 crore subscribers (71.93 per cent) while MTNL came second followed closely by Bharti. Tata and Reliance were the other big players. Also the total broadband subscriber base increased to 12.50 million in July 2011 from 12.32 million in June 2011, showing a growth of 1.46 per cent.